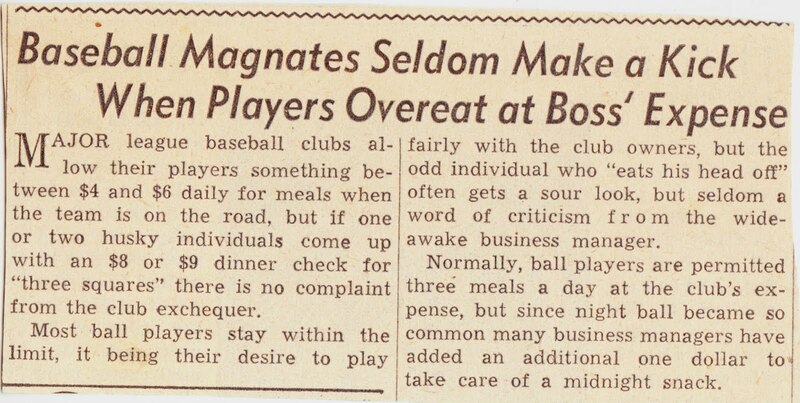 Papergreat: MLB in '44: "An additional one dollar to take care of a midnight snack"
Thought you might enjoy this clipping from a summer 1944 issue of the Grit newspaper. In case you're wondering, though, that was a good amount of money in 1944 and is roughly equivalent to what athletes receive today. A $7 bill in 1944 ("three squares" plus the $1 midnight snack) would be the equivalent of $88.30 in 2011 dollars. What's ridiculous, of course, is that Alex Rodriguez, Cliff Lee, Jayson Werth and all of those other athletes with nine-figure contracts are still getting $92.50 per day, too, for their meals.